Carol Mackenzie Gale B.A. (Hons) M.A. : "THE JOY OF MAKING"
‘Hobby versus Professional, - The Joy of Making’. It was fortuitous that on Tuesday 23rd March, we had a workshop with Emma Shercliffe. Emma is currently doing a Ph.D in which she is researching “What it means to make today. The Experience of a Maker in the Making”. She also teaches. Her passion for the tactile qualities of textiles enhanced her sensitivity to the quality of the cloth, the touch and feel of the textures. She also learnt the art of calligraphy which, she felt, related to stitch. After working with a bespoke tailor and finding it restrictive, she did a degree in Fashion and Textiles in Paris. Later, she worked selecting the fabric trends for Premier Vision which required a deep understanding of colour, cloth and its qualities. Realising that her roots were in patchwork and embroidery, she embarked on a mission to discover what had driven her passion, her pleasure in the instinctive and intuitive joys of making. At another workshop, she provided strips of fabric which she encouraged the group to write their wishes on and hang the pieces on a ‘Wishing Tree’. Later, the pieces were stitched together as a ‘quilt’. Working with various Craft Study Groups, she ascertained that their satisfaction came from a multi-sensory experience of the making along with the interaction enjoyed with the rest of the group. This brings us to the question, who are we? Why do we design? Is it just for our own pleasure, i.e. a hobby or is making part of our professional practice, part of producing work for others to enjoy, be it wearable, art for art’s sake, furnishing, etc. items to be sold. Does quality matter? To me quality is everything. By the very nature of what we do, many of us work in isolation thus missing the interaction with others. In my research, I have found that whilst many artists or designers would enjoy company, they must work alone, as I must. I had not been enjoying my process of creation on my M.A. feeling so stressed about the whole thing that I just couldn’t function. 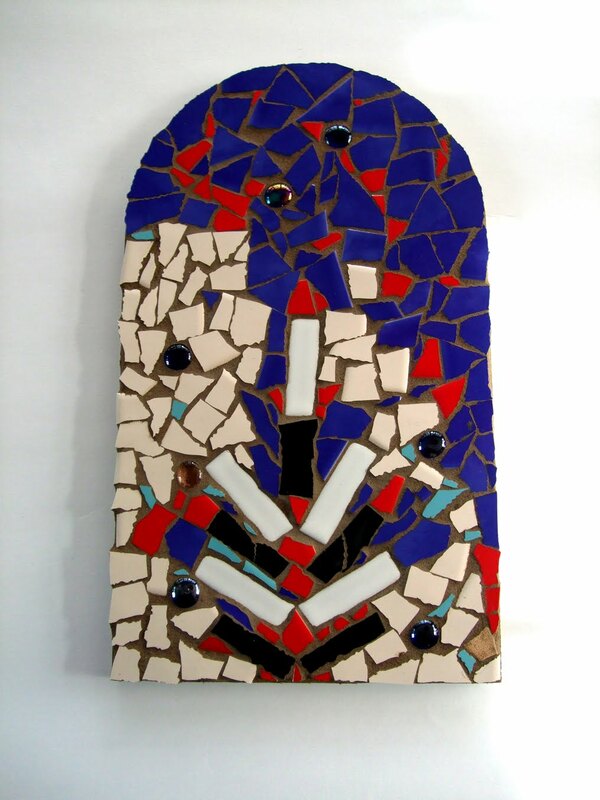 The previous Saturday, I had decided to go to a mosaic workshop. I left my sketchbook with drawings at home and when I arrived, began to draw sketches for my ‘piece’. I suddenly threw it aside. I wanted no structure, no restriction in my first mosaic. Then came the sand, cement and pva mix to rub gently into the crevices – and voila, a mosaic, my first – a joy to behold and the pleasure in the making will stay with the piece. My love is for printed textiles so why am I not enjoying the challenge? Why did I enjoy the mosaic day so much? There was something childlike in the creation, a huge element of ‘play’ and no pressure to create something of any standard. It was free, joyous, wonderful dotted with fun conversation. I released considerable stress that day. Does anxiety show in our finished professional work? How important is shared knowledge? Emma also suggests that we must 'do' in order to 'invent' (i.e. the M.A.) We must sample, sample, sample and explore our way of working to achieve the best results. I have enjoyed my tanker project so much and want my final show to reflect that pleasure, to reflect the extensive research I have put into the 'journey' of the tanker, the drivers, the contents. Much of my stress is in the technical difficulty of making huge disk hangings and in the creation of the disks. How do I attach the fabric to the disks? Should I give up and just do hangings? Some of my pieces are hangings anyway, my proposal at the beginning of my course being to create and explore the creation of large art pieces so I am on target. I am working in flat pattern, on disks where the contents are poured from the centre. For this, I am researching the molecules of the contents to create a flat pattern which trails to the floor. What is the journey of digital printing? Is there a pleasure in creating, using such a technical process? Of course there is. There is a huge army of textile designers whose pleasure is in creating some sort of digital image which will be transferred to cloth. It would be difficult to create the multi coloured prints with a screen. I am intending to create my designs by using both traditional screen printing and digital print together. Some disks will represent the tanker body, a row of six but I am worried about these and may revert to the original idea of doing hangings. However, during a tutorial last week with Gary Alson, he suggested using metal for my disks and I am attempting to source the metal the tanker is made from to create them. i.e. mild steel (I love the rust), or stainless steel (may be too costly for my meagre budget.) Ultimately, it may come down to cost. But these will be heavy too. I am excited that these will be made in the same way as the tanker, on three large rollers which will bend the metal bar into a disk. So, it’s back to the stress and the determination to solve the problems and create a meaningful show.